Cars are some of the most complex forms of engineering as they combine numerous different types of technology, so it's easy to understand how bad information can float to the surface - let's look at the facts surrounding five performance modifications which might not be a good idea. This is probably one of my favourites, because even after people are presented with facts they’ll deny it for eternity. Maybe they’re anti-vaccers too. I’m getting off topic again; let’s look at some data. The figure below is from Carroll Smith’s book Tune To Win. The coefficient of friction between the tyre and the ground is perhaps a tyre’s most important characteristic - the higher the coefficient of friction, the more grip the tyre has. As you can see in the graph above, peak grip results from about -1.0 to -2.0 degrees of negative camber. It’s worth noting that this number will change based on the specific tyre and the lateral load it’s experiencing, for example cars running very high downforce may be able to get away with slightly more negative camber. The highest negative camber I’ve heard of being used in motorsport is in Nascar. According to the competition director, cars can run as high as nine degrees for the outside front (they will race set at about -4.0 degrees, and lean in about 5 degrees), while keeping the rear camber at -3.6 degrees or less (inside tyres run positive camber). You have to keep in mind these cars are running on steep banked ovals with high downforce at incredibly high speeds, so the g-forces are greater than you’ll see on road cars, enabling use of higher camber angles. Outside of motorsport, other examples include GM recommending -1.5/-1.0 degrees (front/rear) for track preparation of the Camaro Z/28, or the Nissan GT-R running approximately -1.0 degrees. Camber kits are for correcting camber, not inducing it! The point is, if you can easily, visibly spot negative camber on a tyre, chances are it’s a bit excessive. 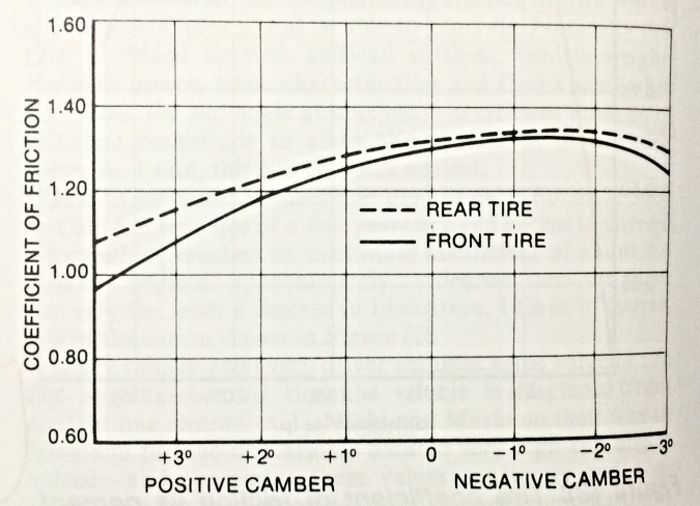 Aside from a reduced contact patch and thus less grip (both laterally and longitudinally), heavy negative camber will also result in uneven tyre wear and uneven heating of the tyre on a track. You can get the stretched look one of two ways. The first way is putting narrower tyres on the stock wheels. This will result in a smaller contact patch than stock, and thus will negatively affect handling. The second way is to put stock size tyres (or larger) on even wider wheels. You may be able to maintain a similar contact patch, but you’ve increased the weight of the wheels in doing so, thus increasing rotational inertia (draining power) and increasing unsprung weight (reducing the effectiveness of your suspension). Either way, your tyres are also more likely to run onto the sidewalls under hard cornering, which is not the intended purpose of a sidewall. 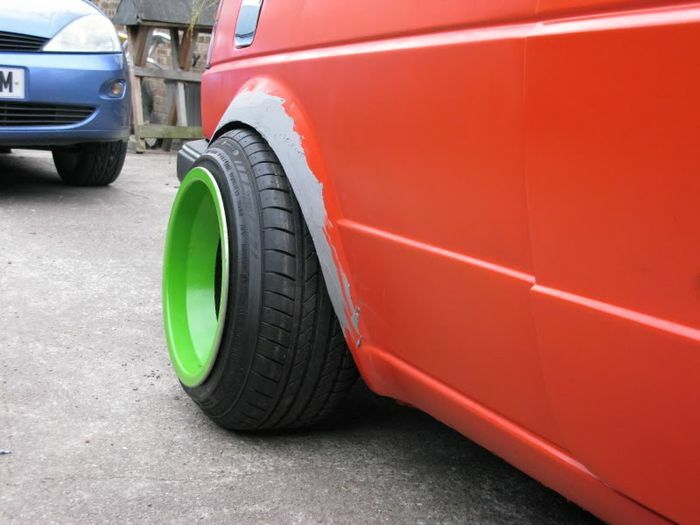 The solution isn’t to run more negative camber, it’s to run the correct size wheel and tyre. Stiff springs may be a necessity in some cases, but that doesn’t make them necessarily better for everyone. Cars used in motorsport tend to have higher spring rates than road cars due to several reasons: they’re lower to the ground and thus must restrict body movement; aerodynamics are optimised for a specific ride height which stiffer springs will help maintain; and professional circuits are usually relatively flat and smooth, allowing for stiff springs to manage small imperfections. That said, softer springs will allow for more grip. Lower rates mean the springs have more travel, and that a larger force will be pressing the tyre down when more travel is necessary. Simply put, softer springs allow for more mechanical grip. The real world is always a compromise: using stiffer springs helps to reduce body roll and allows for lowering the vehicle, but comes at the expense of grip in unstable situations (bumps, imperfections, potholes, etc.). Don’t believe me? Check out the video above to see the math. Like stretched tyres, it’s also fairly simple to understand why slammed vehicles won’t be track stars. Having a vehicle’s clearance within millimeters of the ground means the suspension has to essentially be a rigid system, without any travel. The stiffer the suspension is, the less capable it is of absorbing bumps. Cars which have been lowered too much will either bottom out frequently (thanks to a suspension that’s too soft and not enough clearance) or bounce over every bump (from a suspension that’s too firm). Either way, ride quality will be poor and mechanical grip will be minimised. The hellaflush idea is unsafe enough that the Quebec government has banned its use, and insurance companies can legally reject your claims if you’re in an accident and have these modifications. 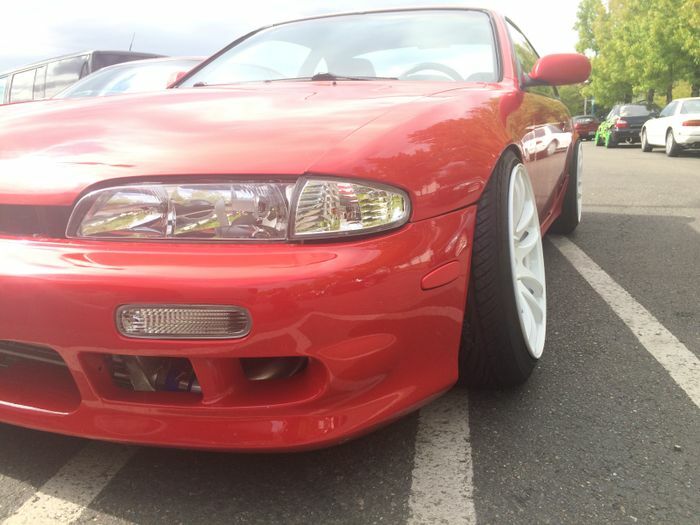 Now if you absolutely must have the slammed appearance, do it right and fit an air suspension. This allows driving at a normal ride height when you’re moving, and you can lower it down when you’re parked. Just like the city bus: Awesome. No really; city buses are awesome. Drilled rotors do have a purpose, but it’s a case of the benefits not outweighing the drawbacks. The sharp edges of the drilled holes create stress rises in the rotor, and as it works through wide temperature ranges - from extremely hot, back down to ambient - it can result in cracked rotors. The benefit of the holes is that they allow for brake compound gases, debris, or water (steam) to escape, and thus allow for the brake pad to maintain contact with the rotor. That said, slotted rotors do this as well without such a high tendency to fail. Also worth mentioning is that by drilling (or slotting) the discs, the amount of surface area avaiable to reject heat into is reduced. Still not convinced? If you’re dead set on having drilled rotors, know that some are better than others. Having a round, curved, chamfered edge rather than a straight, drilled hole will improve the rotor and pad life by eliminating sharp leading edges and thus minimising the stress induced.